Here is the unedited 30 minute conversation/interview with Coleman, three times the length as the one published on CSM’s Passcode. FE: I finally finished your book last night…. at 3 in the morning…. it’s a pretty long book… while I was reading it, it hit me that this book is really about everything that has to do with the modern Internet, so in that way it makes sense why it is so long… you have to provide context for all these different and new concepts that no one has really written about. GC: that’s something that’s been interesting to see the reviews, a lot of them have been repetitive. It is about Anonymous, but it is about so much more…. GC: yeah, and what it means for hackers… they’ve really coalesced into a major political force just in the last five or six years. FE: I’m glad you brought the political activism angle, do you think there will ever be an Anonymous political party? 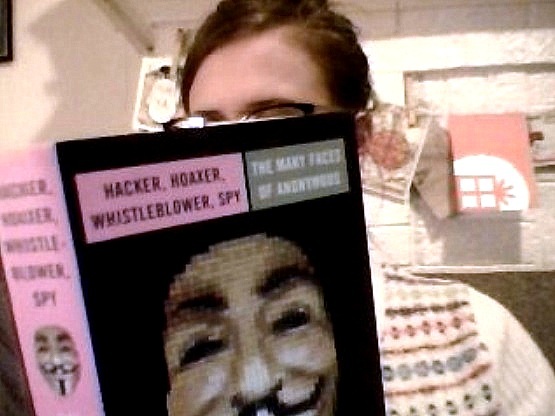 FE: So, onto prepared questions… what does the media still get wrong about Anonymous? GC: I am currently writing this article for this anthropology book about relationships with journalists, and how I came to see journalism differently over time, just as the same way Anonymous is not unanimous, the same can be said for journalism. There are much more local journalists, and some are fucked up, there are structural constraints, and it is the same for Anonymous. GC: But basically, I do think a lot of journalists get it, and initially there was three things that were really difficult. First, so many people just wanted to say that they were all hackers and I think over time a great majority realized that sure hacking is very important, but what makes Anonymous interesting is precisely the fact that general geeks can join. GC: The second has to do with the leader issue and for that first year [of research], in 2011, so many people, even journalists that I respect, were still wanting to boil down leadership to sabu or topiary. While it is absolutely the case that the hacker groups command more power, for example, topiary and sabu were two of those charismatic public figures so they became really important brokers between the world of Anonymous and the public, these are not leaders… the chat logs show how organic everything arises. GC: And that’s really tough to understand [for outsiders], and still continues a little bit, except for those people who have actually bothered to find out about Anonymous. Here’s a great story: a senior investigative reporter producer for one of the top networks contacted me soon after operation ISIS started, and they were like, well, you know, “can you get us in touch with the Julian Assange type figure in Anonymous?” and I was like “oh my god, did you just not read a single article? Because had you read a single article” the journalism has gotten so good, I think, that he wouldn’t have asked such a stupid question. FE: it’s an easier narrative to sell, it’s easier to understand, for them to do their job. GC: that’s exactly it. And a lot of people in the public and some journalists still think they’re primarily vigilantes, while it is — I don’t have a number but it is probably a quarter or less of their operations, are vigilante operations. FE: Speaking of vigilantism, about the “white knight ops”… do you think they were the best way Anonymous could have chosen to endear themselves to the general public and to feminists? GC: I generally agree, although it’s fascinating because Steubenville is what put them on the map in that “white knight oping” I think overall– and this is one of the most heavily qualified statements– they did a service but they did it poorly. I do think the two subsequent ones were executed with a lot more precision and nuance, thankfully. But I wish that had been the case with Steubenville as well. We have to take seriously that collateral damage but I also think it’s something journalists also fall prey to as well, they make these big big mistakes when they take action and they should do everything possible to call out folks who do that, like that Rolling Stone piece, but I am not going to damn the entire bit of Anonymous for making those mistakes, for one person, unless they keep on doing it time after time but they didn’t. GC: yeah, and that’s maybe one of the weaknesses to raise, when you don’t have a spokesperson, to say “hey don’t listen to them” and I at one time took that role, and helped a lot of journalists, saying “he is credible, she is credible, he is not credible” but because I am not active any more I don’t play that role. GC: I would say in 2011, the AnonOps reporter channel was that way, but post when AnonOps was DDoSed, when Ryan Cleary dropped all the IP addresses, AnonOps became less of a central place…and that reporter channel couldn’t function in the way it once did. You’re right, there isn’t a single place you can go today for that type of verification…it’s much more fragmented today. FE: Were you aware of the controversy around KYanonymous? GC: so the hackers are all male, and we could blame Anonymous for keeping them out, but they are not keeping black hat hackers out because they barely exist. Now that said, there is a culture where they embrace this very offensive language, including misogynistic language, and this is obviously going to be a barrier, not simply for women but certain quarters of the leftist community. GC: they love Anonymous because they’re bold, taking action, and some of whom are still uncomfortable with the language, like how Jeremy Hammond was, but still decided that it was worth it, others who kind of enjoy the transgressive language, and then among a kind of a camp on the left, understandably, their language politics are too naive and they don’t buy into the importance of transgressing language and norms and that acts as a barrier for them. i won’t be able to solve this question right now I actually go back and forth myself on the language issue, and certainly, it can act as a barrier for women and some leftists in general. That is just a fact. whether or not you agree with the language politics, it can and will act as a barrier. FE: I thought with the “white knight ops” that it would draw more women to Anonymous, but it didn’t really, probably because of the language and the culture. GC: yeah, for sure, I mean, like, because of trolling or…? GC: I do not evny those folks who have to write purely on trolling, because you become polluted by the trolls. Many people can respect very much what you do but a lot of people, and I’ve seen this with some of my good friends that write about trolls, some people, you know they are not giving trolls a free pass whatsoever, they’re trying to go beyond, “it’s simply racism”… there’s other things going on, right. As a result, they become polluted by the trolls and certain academics are really critical of that type of scholarship. Which is very very problematic. I was certainly concerned because I addressed trolls to some degree but I was relieved that I didn’t address it deeply. You know one of the difficulties is weev, in a lot of ways, because, obviously I interacted with him a lot and I really did want to convey how frightening of a troll he was, but not necessarily, simply moralize it from the get-go but show the cultural logic. I think I succeeded. Some of his victims thanked me for not white-washing him. But also, I went beyond the kind of moral narrative of good and bad even though I think it was pretty clear. FE: do you feel DDoS will ever be recognized as a form of protest? GC: Yeah, it might, in certain places of the world, certainly not the United States. FE: why not the United States? GC:Because it falls under the Computer Fraud and Abuse Act, because the United States has zero tolerance for “computer crimes” right, it will put anything under, any attack under the CFAA and just the history has shown they are not going to budge on this. Granted, the paypal14 outcome was more favorable than I expected, and this goes to show [that if] there is a big movement behind a case [it] can make a difference. If people weren’t watching, if there wasn’t a Free Anonymous campaign, if they didn’t have great lawyers, it would be much worse. FE: so in your book you wrote that Brazil, Italy and Hispanic-Mexican Anons were the largest contingent. Do you still think that is the case in 2015? GC: yeah, Italy not so much because there have been a lot of arrests, but certainly lulzsec peru is still kicking strong, and even in September they had that famous hack against the Peruvian government, that linked to emails that exposed corruption. FE: and the last one is how it is not entirely Anonymous, the collective has to be pseudo-anonymous to function, so… out of all these levels of contradictions, which one do you think is the hardest to explain, and get around? I think the hardest thing to convey is the changing structures of leadership, because people still are like, “but there must be leaders” when they say there is not a single spokesperson, and then I have to agree with them in that certain moments, certain teams or individuals are more important than others but, because of the fact that there are multiple ones, and it is highly dynamic and shifts, it means that it doesn’t resemble a certain organization where there really is a chosen spokesperson, or having an assigned roles, like with Red Hat Turkish group. BC: it really makes your ADHD worse…but that’s really hard because it is not simply the contradiction, if you have not experienced this interchanging spaces it is very understandably hard to wrap your head around it. GC: and that was like the central idea, I didn’t reveal it until the end, but yeah, my whole book is traveling this contradictory set of goals… there are too many misconceptions but I also wanted to make it exciting and enchanting and all sorts of things. FE: so Barrett Brown, I know you said you didn’t want to talk about him, but…why do you think he was given more prison time? GC: exactly, it’s true he was at times very close and involved in a lot of operations but you know, I was there for a lot of the Stratfor stuff, and Antisec was keeping him at bay. They didn’t even give him the emails! So it was really this unbelievable witch hunt against him, and it is true they capitalized off the fact that he was a central participant to kind of make their case, even though I think it was really ungrounded.